With the dominos set to fall in free agency over the coming months, there will certainly be big money, multi-year contracts to be had for some of the top available players. There will also be those who opt for one-year deals, whether that be a veteran looking to show that they still have some game-changing ability or a player looking to bet on themselves and turn a productive season into a more lucrative long-term deal in the future. Below is a list of seven players who could garner one-year deals for 2019. In the last several years, Houston hasn’t quite been the truly elite pass rusher that he showed himself to be from 2013 to 2015, grading above 90.0 each of those three seasons. The 30-year-old proved that he is still one of the top pass-rushing options on the market though, after a 2018 season in which he saw his overall grade top 85.0 for the first time since that 2015 season (85.7). Among all edge rushers with 200 pass-rush snaps, his 14.2% pressure rate ranked ninth, and his 20.3% pass-rush win rate ranked third. That kind of pass-rush success is something that nearly every team in the NFL could use, and it will make Houston a prime one-year deal candidate to show the rest of the league that he can still produce among the best in the league. Since entering the league in 2007, Weddle has played a massive 11,718 total snaps for the Los Angeles Chargers, and the Baltimore Ravens and he hasn’t played fewer than 750 snaps in a season since his rookie campaign. 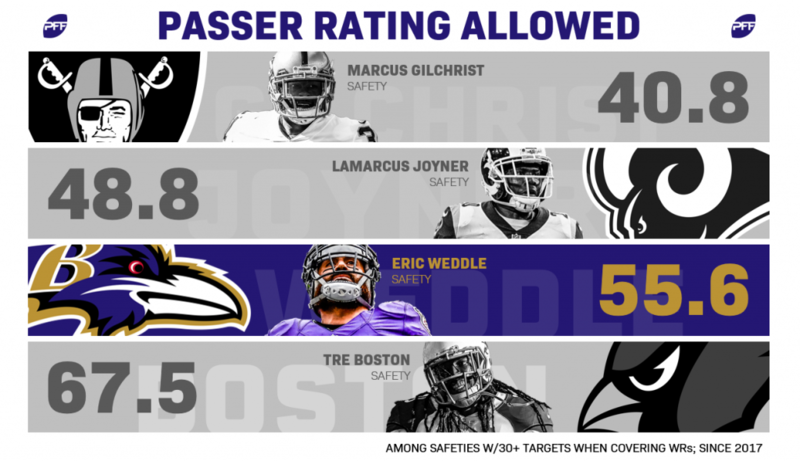 Needless to say, he will bring plenty of experience and consistency to whichever team signs him – as PFF analyst Mark Chichester pointed out earlier this week, no safety in the PFF era has recorded more single-season grades above 70.0 or 80.0 than Weddle has. There is certainly a deep pool of safeties available in the free agent market to which Weddle will add his name and that, along with his age (34 entering next season), may lead to a one-year deal for the veteran. One category of players likely to sign one-year deals when free agency comes around are players whose careers have been impacted by injury – no one exemplifies that more than Verrett. After a breakout 2015 season in which he recorded an overall grade of 88.4, Verrett has played just 323 regular and postseason snaps over the last three seasons, none of which came last year. Set to hit free agency with that kind of injury history, Verrett is a prime candidate to bank on a productive, healthy season to re-cooperate his value and go after a long-term deal a year from now. The team that takes a chance on him will hope he can put together a full season and perform as well as he did in 2015 when he allowed a passer rating of 82.9 on throws into his coverage. At the age of 37, Wake is one of the older players in the NFL, but that doesn’t mean he has been any less productive in the latter stages of his career. On 517 defensive snaps last season, Wake recorded an overall grade of 81.6 and was among the league’s most productive pass rushers; he was one of the two pass rushers to record a higher pass-rush win rate than Houston, winning on 21.7% of his pass-rushing attempts (second among qualifying edge defenders). Wake still carries significant value, especially as a situational pass rusher, proving that whether he re-signs with Miami in 2019 or signs elsewhere, it will likely be a good deal. Prior to the Ravens abandoning Joe Flacco as their starting quarterback and transitioning to the most run-heavy offensive scheme in the NFL, Brown had begun to rekindle the deep threat ability that he had flashed early in his career. In the first six weeks of the season, Brown caught seven passes (second) that traveled 20 yards or further downfield for 266 receiving yards (third). He had a quiet finish to the season with Lamar Jackson at the helm, leading to Brown likely looking at another one-year deal to showcase that he can still win downfield with a quarterback that can get him the ball. The last time Brown played with a quarterback graded above 75.0 was with Carson Palmer in 2015 when he caught 72 passes for 1,108 yards and seven touchdowns. 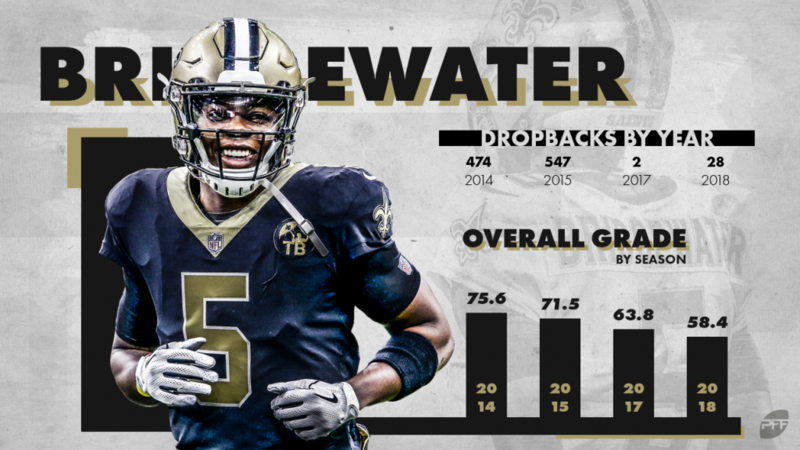 Last season, Bridgewater signed a one-year “prove-it” deal with the New York Jets before being traded to the New Orleans Saints. Bridgewater didn’t get much chance to prove that he was still the starting-caliber quarterback that he showed himself to be in his first two seasons in Minnesota; he played just 71 total snaps as the backup to Drew Brees. That leaves Bridgewater in a similar position where he may look for a one-year deal where he could become the starting quarterback and boost his value for a potential long-term deal. In his last full season in 2015, Bridgewater recorded an overall grade of 71.5, ranking 16th out of 32 qualifiers. Barrett is an interesting case as far as free agents go. 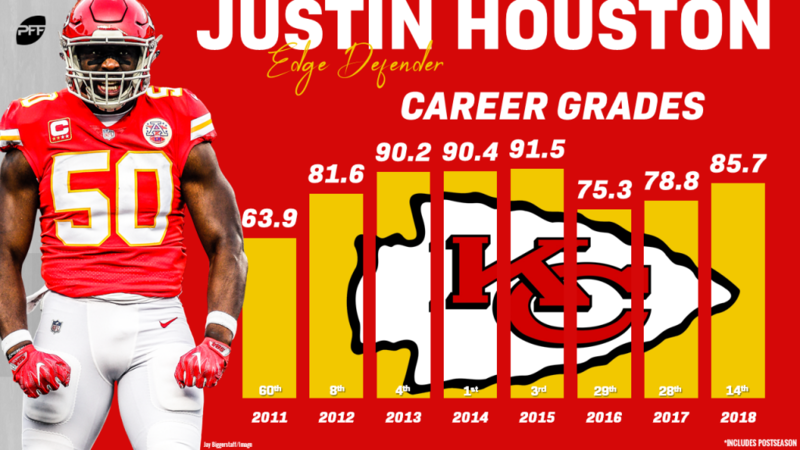 He has graded at 75.0 or higher in each of his first four NFL seasons, and he enters free agency at just 26 years old – both of which would indicate that he is in line for a big contract. The only issue is that he hasn’t ever had a full-time role on the Denver Broncos defense, serving as a third or fourth option in the edge rusher rotation for most of his career. His career-high in pressures came in 2017 when Barrett recorded 43 total pressures on 324 pass-rush snaps. Because of that, a one-year deal in which Barrett could finally seize an every-down starter role and put up big-time numbers could be what Barrett opts for before going after his first major contract.